How Do We Frame Sports Shirts At Such A Great Price? 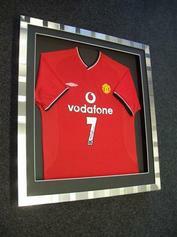 In fact how do we frame all sporting memorabilia at such a great price - How do we actually do it? If you would like to forget the rest of this page simply click the above images to go straight to the relevant football shirt framing offer! But hey,why not read on and find out how we manage to frame football shirts and other sporting memorabilia at such a great price? We are sometimes asked how we manage to frame football shirts and general keepsakes and memorabilia at such a low cost, as many of our customers have seen shirt framing and other memorabilia framing advertised elsewhere at twice the price we charge, sometimes even more…!!! We also have customers coming to us letting us know they have enquired with another framer regards shirt framing, only for that framer to suggest to that particular customer that we use lesser materials and cut corners or otherwise. This flawed, wholly incorrect, wrong and unfair suggestion by other framers has, quite frankly upset us, hence this page to make clear. Ok, So how do we manage to professionally custom frame shirts and other sports memorabilia for a much lower end price to the customer, yet still retain full reversibility and incorporate supreme quality within the framing process, and still manage to profit? Do other shirt framers display 100's of images of their work? Do other framers per se go into as much detail on their website? First of all our overheads are low, we have no debt, bank finance or overdraft and pay for our supplies up front. Further, we also work on a very low profit margin. In other words we work darned hard for not a lot!! Other framers may not wish to. We are aware some framers will not frame a shirt unless they come out the other end at least £100 in profit, hence the £160/£170/£180 quotes you may be receiving. We do not work this way, nor follow this train of thought - as much as we would like to!!! 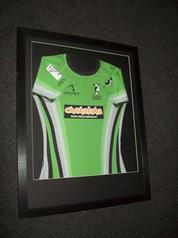 Quite evident really when you look at our great prices on professional sports shirt framing. Framing a shirt or any piece of sports memorabilia is a skilled job and rather labour intensive with the framing of each shirt taking up to 2 hours. We do not as such charge for our labour, instead we work out a total costing and add just a little on top for our profit - after all we are a business and we have to make something!!! We offer a great range and super choice of frames for the framing of your football, sports shirts or any other item of sporting memorabilia or sentimental keepsakes you require framing. We get a tad upset, for example, when other framers suggest their frames for shirts are of superior quality. Why do we get a tad upset? (we would like to use stronger words, although we shall at all times remain ladylike regardless…!!! )....Well because they name us specifically, although how do we know? - Because those customers then come to us to have their sports memorabilia framed and tell us what they have been told elsewhere. It makes us happy bunnies NOT...!! !....although we do at least thank other framers for at least mentioning our business and providing us with more custom. Added to which there are only so many suppliers of frame moulding in the UK, and guess what - those very same other framers generally buy the same materials from the same places as we do!! - so it is the same stuff!!! That is of course unless other framers actually manufacture their own frame mouldings. Fair enough some frame restorers in the art world actually do, although the majority, that is 99%, of framers do not..!! We are also aware that some retailers offering shirt framing services do not frame at all, instead purchase ready made set size frames, often from online auction sites, and then make the shirt fit the frame - which is not best practice at all. With other framers are you clear as to what you are ACTUALLY getting for your money? Are other framers as clear on their pricing as we are? 1. Your shirt or piece of sports memorabilia will be framed to a high standard using a totally wholly and fully reversible framing process, and your framing will be manufactured in order for it to be a precise fit for your prized shirt or other piece. We make the frame to fit the item - not the other way round. 4. You will receive 2mm Glazing (not 1.2mm) - either glass or Perspex depending upon your requested application (ie safety glazing such as perspex is more suitable in public areas). 5. You will have your shirt or other piece of sports memorabilia deep rebated or shadow box framed - if it is a shirt - your shirt is spaced away from the glazing to enable the shirt to ‘breathe’ and thus creating a 3D effect that your shirt is floating in the frame. 7. 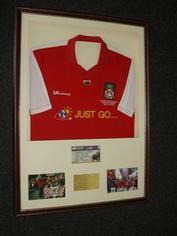 We also offer on all football shirts S/M/L/XL - long sleeve or short sleeve, an all inclusive shirt framing deal whereby you may include up to four reasonably sized additions such as photos, ticket stubs, match passes, COA you may have that you wish to include with your framed shirt etc PLUS an engraved or printed plaque manufactured and supplied by us - all currently on offer for a low set price of just £99.00 irrespective of size. Beat that! 8. Great communication and customer service, before purchase, during purchase, and after purchase. We want you to be happy with your purchase. We thank you for reading this page and we look forward to working with you on your next sport memorabilia framing project. Are other framers easy to contact for friendly human advice, either instore, online up to midnight or via telephone? Make us your first stop for the framing of all keepsakes and sporting memorabilia. You would be mad not to. You will though be well chuffed you did...!!! In fact make us last, please do get quotes elsewhere first, then bring them to us and let us beat them hands down. Simple. Job Done. Welcome to our world. Welcome to the world of Discount Football Shirt Framing. We do look forward to working with you.